The newest train in JR East’s Shinkansen fleet is the E5 “Hayabusa” (meaning “Falcon”), and is the fastest production Shinkansen train to ever operate in Japan at an operational speed of 300 km/h (186 mph). The E5 operates between Tokyo and Shin-Aomori, and travels up the eastern coast of Japan to the northern tip of Honshu, the largest of the four islands of Japan.The newest train in JR East’s Shinkansen fleet is the E5 “Hayabusa” (meaning “Falcon”), and is the fastest production Shinkansen train to ever operate in Japan at an operational speed of 300 km/h (186 mph). The E5 operates between Tokyo and Shin-Aomori, and travels up the eastern coast of Japan to the northern tip of Honshu, the largest of the four islands of Japan. 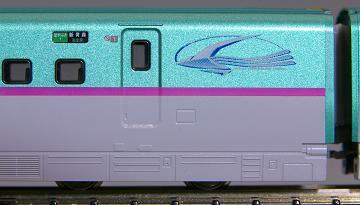 The E5 features an recessed coupler system that can be deployed (similar to that of the E3 "Komachi" and E4 MAX), allowing it to link up with other E series shinkansen trains for prototypical combined consists. Equipped with a pendulum system which inclines the model train when it runs on a curve just like its prototype. Tigh-lock diaphragms and car-to-car couplings keep a prototypical smoothly connected appearance without sacrificing turning radius (minimum radius is 315mm or 12 3/8").